Treat yourself and set off on a journey discovering different peppers and salts from around the world. 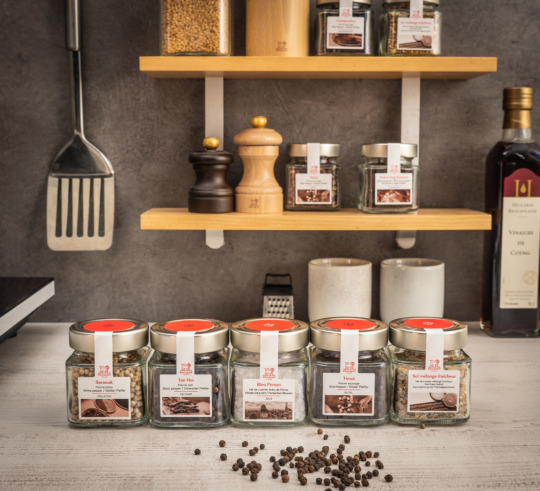 This set is an open invitation to discover three premium peppers from Nepal, Malaysia and Vietnam, stunning Persian blue salt and a blend of salts with fruity aniseed notes. Set off on a spice discovery trip! When it comes to pepper, Tan Hoi black pepper with its warm, woody bouquet takes the senses on a journey to its native Vietnam. Then head to southern Asia where Sarawak white pepper will tantalise your nose with its Malaysian vegetable fragrance. Subsequently, head northwards to Nepal and amaze your taste buds with the surprising citrus fruit aromas of Timut wild pepper. When it comes to salt, start by sampling the potassium rich taste of Persian blue salt formed 100 million years ago in the heart of the Iranian mountains. End your journey with the fresh and sparkling aniseed taste of the Freshness salt blend, comprising lemon, anise, fennel and coriander.